Study on Chopin's Étude Op. 10/5 & Op. 25/9, played simultaneously "Badinage"
A splendid recital, cleverly programmed and deftly executed. Mr. Libetta clearly favors orchestral textures – and orchestral music. Thus he offers several transcriptions: two movements from Respighi's Ancient Airs and Dances, Ravel's own piano reduction of La Valse, and Liszt's arrangements of themes from operas by Wagner and Gounod. Orchestral sonorities predominate in several other selections – especially Godowsky's conflation of two familiar Chopin Études (op 10/5 with Op. 25/9) and II from Debussy's Estampes, "La soiree dans Grenade", also known in an orchestration by Leopold Stokowski. 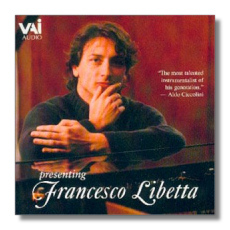 This disc was recorded in concert in February 2000 at the Miami International Piano Festival of Discovery. The Italian-born pianist was just 32 years old. He had just begun conducting, which may explain his interest in orchestral repertory. The Respighi fares best, perhaps because these pieces were originally conceived for the lute. The piano transcription clearly recalls the spare textures of the originals. The crystalline clarity of Libetta's playing and his obvious affection for the music make his lively readings especially compelling. The Liszt and Ravel are less remarkable. Although the composer himself prepared the piano reduction, one misses the vivid panoply of orchestral sonorities in La Valse. Moreover Libetta's interpretation – despite some brilliant playing – lacks the last measure of Prussian menace found in Paul Paray's now classic monophonic Mercury LP. Then again no conductor has managed to surpass Paray in the nearly half century since his remarkable recording appeared. The Liszt transcriptions of themes from Tannhäuser and Faust are typically trashy and overstated. Libetta plays them boldly and without apology. Despite Mr. Libetta's obvious command of the keyboard as demonstrated in these transcriptions – not to mention his second encore, Saint-Saëns's bravura "Étude in the Form of a Waltz" – the best moments here are the most introspective. Undoubtedly that's what prompted one critic (quoted in the booklet) to compare Libetta with the immortal Dinu Lipatti. While that's a bit of an overstatement, Libetta does demonstrate an affinity for Debussy's ethereal Estampes and Chopin's gentle Mazurka (Op. 68/2). Tempos are ideal in both, and there's a welcome sense of mystery and wonder at every turn. The sound lacks the presence and richness of a studio recording, and a bit of low level noise is audible between selections (an air handling system in the hall, perhaps?). Some occasional audience noise intrudes from time to time, and applause erupts at the end of each selection. Fortunately the performances are so riveting that these minor distractions are easily overlooked. VAI assures us that this is the first in a series of CDs and videos from this remarkable young pianist. Let's hope that future discs include more of his magical Debussy and soulful Chopin.